The road cuts through cropland and fields of baled hay. Bridget and Spike are asleep on the bench seat behind me. We’ve been on the road all morning. They’ll be getting restless soon. If I pull off the road, it will wake them. Well, I have to look at the map and make a decision. Interstate 15 is up ahead. The town of Dillon is a few miles north of here. We are almost out of propane, and it wouldn’t hurt to pick up some groceries. Now that we’re out of the mountains, it’s warmer. I want to camp near water. 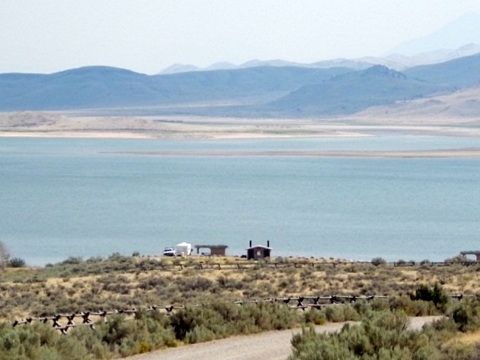 The obvious choice is Clark Canyon Reservoir, about 18 miles south. I find the Safeway in Dillon and stock up. Back at the PTV, the crew is howling. I open up a deli box of chicken which we share. Then I let them out for a brief walk in the grass. I’m proud of the way the crew accepts getting back into the PTV, even after riding all morning. All they need is a walk now and then. They can tell this isn’t our home. I drive us to a nearby gas station and fill up the tank. A man walks by. I inquire about where to buy propane and he directs me to the Centex gas station up the street. 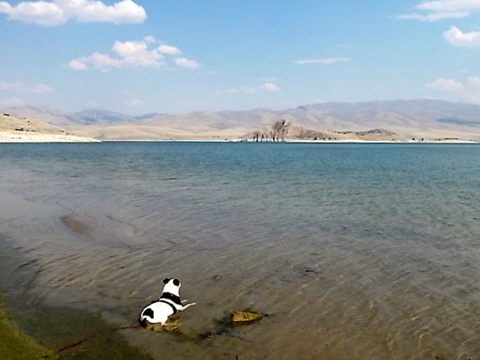 That task completed, we take the interstate southward to Clark Canyon Reservoir. The exit is right at the dam. 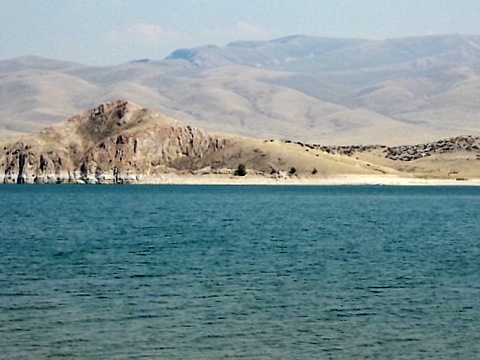 The lake is quite large with a rocky, barren island in it that reminds me of Elephant Butte Lake in New Mexico. Crossing over the dam, I turn into the first campground. The typical pay station is at the entrance. “Thirty dollars?” My heart sinks. I look at the place more closely and realize it’s a private, commercial campground. Whew! There has to be something more affordable on this lake. I look across the lake from where we came. He stands up. “It’s FREE! Fourteen days and it doesn’t cost a thing,” he announces with a smile. “Trouble is, it’s full,” I respond downheartedly. I thank him and drive over the dam again. 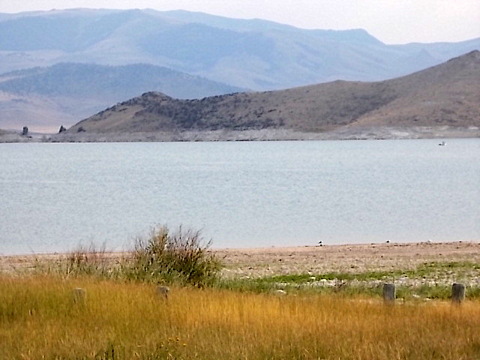 The first free campground has a stunning view of the lake. I slide the BLT into a spot on a promontory. The crew and I follow a rocky path down to the water. Spike takes a little soak and Bridget romps around on the sand. Each campsite has a three-sided, wooden shelter and a picnic table with a fantastic view. I take a close look at the shelter. It’s cobwebby and kind of depressing with its brown, peeling paint. I bet it can get really windy up here. I walk around. Then I see them. A huge mass of mosquito-like insects all over one side of the shelter. Some fly around my face, but they don’t bite. I open the side door and they jump back in the PTV. I check another, similar campground and see more of those insects. Yuk. And it’s hot over here. The campground on the other side is breezy. I go back across the dam again to the first campground, the one with the nice shelters. I drive around until I find a place we can park. Hmm . . . No picnic table. No shelter. Some road noise. Oh well, this will do just fine. Before going inside for the night, I put my camp chair and the crew’s pen back in the PTV. In the morning I’m going to keep an eye on those lakeside sites. As soon as someone leaves a site, rvsue and her canine crew are pouncing on it! Spike wakes up early wanting to go out pronto. I quickly snap the crew into their black suits and head out the door. As we walk past a clump of trees, I notice a class C pulling away from a lakeside site. “C’mon, guys! We gotta’ get going! Hurry!” Spike, who has difficulty accepting a change in direction, resists, but I pull on his leash so hard that he gets the message. I toss the crew into the PTV and in a flash we’re in that campsite! We’re near the dam and face the water. The guy I spoke with earlier is in a neighboring site. “Hey! You got it!” he calls as he walks over. We stand next to my picnic table and enjoy a great conversation. I learn his name is Michael and he’s a geologist, semi-retired, doing research in the area. I ask some questions. 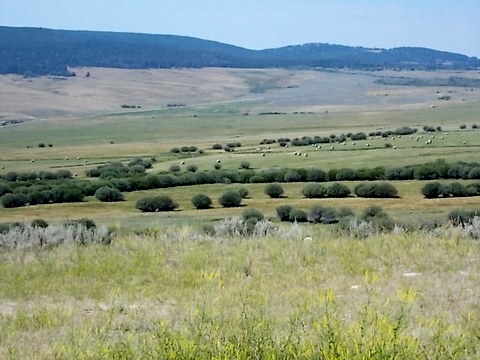 He points to the surrounding hills, explaining the processes that formed them. “Did you know Sacajawea reunited with her Shoshoni tribe here?” He admires the BLT, showing great interest. Then he announces he has to go. “Probably . . . at these prices!” I jokingly reply. Soon he’s packed up and waving goodbye, as he drives off towing his A-frame trailer. Due to popular demand, I’m experimenting with a new feature for rvsue and her canine crew. It may be a while before we get it right. “As per usual, the Bridge and I take a little stroll around the campground this morning. ON LEASH. Like we don’t know how to walk or something. I leave my mark in several places. The Bridge does, too. Flat on the ground, the girl way. Pffft, pathetic. And, of course, she does poopers right on cue. I can’t do that. A man needs his space. You know what I mean? I’ll sneak off later and do my business in private, when and where I choose. 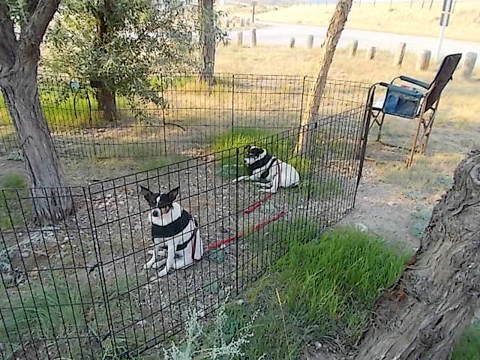 This entry was posted in Simple living and tagged Armistead Campground, Clark Canyon, Dillon, Grasshopper Valley, Montana, RVing. Bookmark the permalink. What would I do without the !!!!!!!!!!!!!!!!!!!!!!!! You have a wonderful !!!!!!!!!!!!!!!!!!!!!!!! personality, Pauline!!!!!!!!!!! Love you, too!!!!!!! Nothing’s better than free! 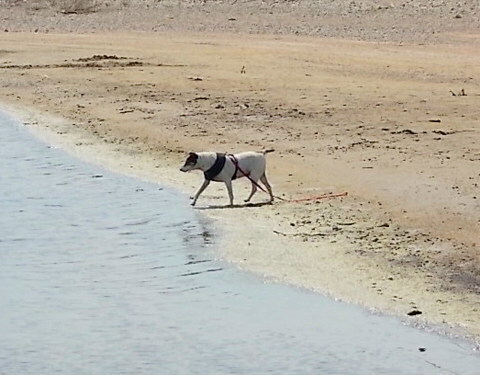 And of course…pics of Spikey in the water. Spikey’s got a blog! Even though the last few camps have only been $4 a night, there’s something about free that makes a camp seem special. Warms my cheap heart. I’m glad you were on the ball and able to grab a better campsite. Free is good!! After being in the mountains, does it seem pretty hot where you are now? Cute post from the crew. One day it got really hot for about an hour at four when the breeze stopped. Yesterday and today has been cool. The sky is overcast and there’s a cool breeze. Check the Weather widget above. It’s been accurate lately. Love the new canine cornor. Spike’s the man! But don’t skimp on Bridget, she’s a sweetie. The new site look great and a good price ta boot. Enjoy. Hi, Harriet! Bridget will have her turn. Yes, I’m happy with this camp. And I have internet here! 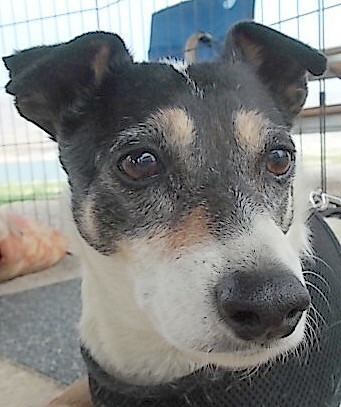 Spike, the Roving Reporter. Love it. I like a male slant on your traveling. Well, Spike’s real good at slanting things his way . . .
Spike speaks! Maybe he can give us a tutorial about finding just the right place to soak. Any place with water is fine with Spike! Sticking my nose where it does not belong may I recommend you attempt to visit Bannack State Park. http://bannack.org/index.htm Campground is nice by a creek with cottonwoods but a little pricey. For a day trip it is not that far from you. It is an old ghost town with great stories of the vigilante days. I like the fact that they have not made it into a commercial touristy spot. Just your basic dirt! I may do that day trip, Bob. I passed the turn on the way here. It was late in the day with errands to be done, so I went on by. Michael mentioned it, too. It’s the original capital of the Montana Territory. Sticking your nose in the comments section is encouraged! Just beautiful and the pictures of the crew in the water is stunning…best shots yet! Is it your new camera? Canine corner is too cute! Yes, cozygirl, it’s my Nikon Coolpix, which I’m getting used to. Thanks for the compliments. Great job grabbing that campsite. One needs to be a little patient and a lot vigilant when the price is so right. I’m thinking that Bridget will have plenty of comments about Spikey and his behaviors when she gets her turn at the computer. That’s a really handsome picture of Spike as the blogging dog. Have a great evening, Sue. My Spikey is a handsome boy, that’s for sure. You have a great evening, too, Karen. In all my years of observing the male species from all over the country, the majority of the handsome ones have Montana origins. I must follow-up with this observation some time; and, you and Wanda & Jerry (of EggRolings – they have a Casita too) are giving me places to check this observation out again. Thanks for the update Spike!!! Just be careful and remember you are outnumbered by females!! Great to see your post as usual Sue, keep smiling and loving the life you are living!! What a great picture of Spike’s face. I can hardly wait to read his perception of life on the road, and how he earns his meals. Some of that scenery is fantastic, you’re having a great summer. Can you believe it has been over a year since you started doing this? Time sure flies. I am going to an RV show next weekend with my husband, he may get pressured to buy just a little trailer, 19-23 ft, so we can go on weekends until we can get a week or two off next summer. Wish me luck in that department. Oh ho! He is quite tight fisted. Spike, earn his meals? Not hardly. Good luck at the RV show! It’d be a shame to waste weekends when there is so much fun to be had. The picture of Spike in the water looking out over the lake is fantastic! Frame-worthy for sure… 🙂 Glad you snagged a spot in the nicer campground. And the “free” part is pretty darn nice, too! That photo surprised me. I didn’t expect it to turn out so well. YEA!!! I’ve been waiting for Spike to give his perspective on this new lifestyle. My mom says to get prepared because she wants to hit the road in 37 months when she gets to “retire”. I would be happy if she just took me down the alley for a walk. It’s one of the best sites in the campground. We’re right in front of the water and over to one side is the boat ramp. I like to watch the people, coming and going. Well, you wouldn’t expect Spikey to discuss how lovely it is here, would you? Yeah, the vulture technique is sometimes necessary. I’m not as bad as some. I don’t park by the site with the motor running. Although that day may come . . .
“poopers” I laughed out loud at that one. 🙂 I’m so glad that Spike is sharing his point of view. I never know what’s going to strike someone as funny. Poopers is a longstanding word in our vocabulary, goes way back. I always stay there when heading up north – it’s a good solid day’s drive from Moab. Once in awhile, a train goes by and makes a big racket. You can also access the other side w/o going over the dam, just head south on the highway and take the most likely road, assuming you want to go to that side after finding the nice spot where you are. Stay north as long as you can, cause it’s hot down here – unless you head over to Colorado. Good advice, Chinle. This campground is a handy stop, right off the interstate. Train hasn’t been bad, so far. Maybe they’ve got a new whistle. Great price!! And sounds very nice…hope you have a great 14 days there!! PS…I hope we can find a “Bridget” type if we get another fur baby one day!! Our last doggie also went on command…she would TRY even if she could not manage much!! You and the crew rock, just love the way you tell a story. Spike is lucky to have his canine corner. He can tell a good story also can’t wait to see what Bridget has to say. You scored again. The camping Goddess looks out for you, as you do for yourself. So glad to hear he dog tails too. I love Spike’s commentary! 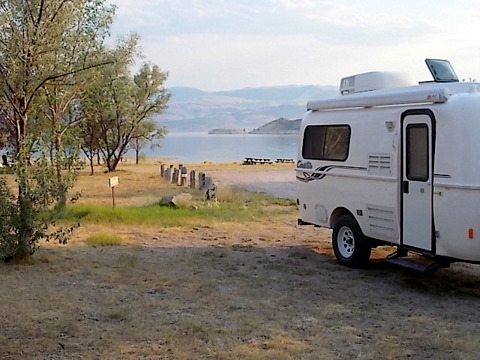 Looks like a lovely spot – free is the best type of campground! Thanks for letting me know, Kellee. I didn’t buy from an individual so maybe my suggestions aren’t as good as others. I’d look for a forum for owners of my camper. I learned a lot from the Casita Forum. If you can’t find one for your particular camper, go to a more general one, like rv.net, and ask questions. 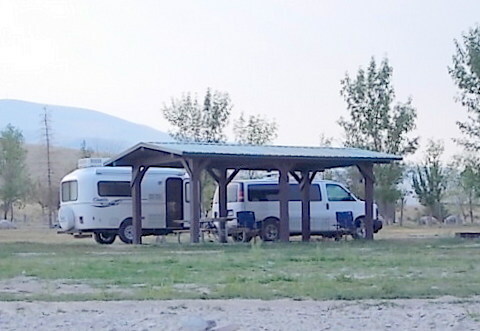 Try to connect online or in person with people owning the same type camper. You are always welcome to ask questions here. My readers are helpful and full of practical knowledge. Good luck! F you buy a Casita Arizona Eileen had written a very detailed manual A-Z Owners Guide. I just got it & she has combined wisdom of other owners & craftsmen who make modifications to Casitas & know it inside & out! Excellent pictures and commentary…a joy to cruise along with you and the crew. Thanks a lot, Ann. Nice comment. We’ll see how it goes with the crew authors. I’ve been reluctant to give Spike a platform for his beligerence. Ok Sue, Now you’ve gone and done it!!!! Now, Doogie Bowser want s HIS own blog and I’m sure Radar will, too. Scottie says it would disturb his sleeping time but still….. Another great blog and GO SPIKE!!!! You’re funny. Rein in those wild hounds . . .